Who invented the Sandwich? The name of the person credited with inventing the Sandwich is John Montagu, the 4th Earl of Sandwich (1718 - 1792). 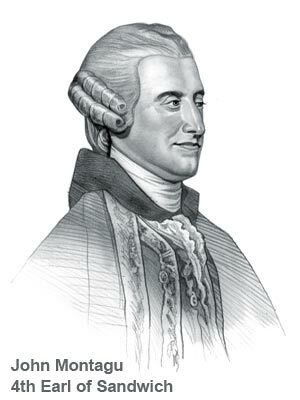 John Montagu is not only famous as the British inventor of the Sandwich but also as a British statesman and nobleman. When was the Sandwich invented? John Montagu invented the convenient snack in 1762, during the Industrial Revolution period of invention (1700 - 1860). Definition of the Sandwich: The Sandwich is defined as a convenient snack or portable finger food, consisting of two, or more, slices of bread with a filling between them such as cheese, sliced meat and sliced vegetables. Fact 1: Who invented the Sandwich? The Sandwich was invented by John Montagu in 1762 during the Industrial Revolution era of inventions (1700 - 1860). Fact 2: Who invented the Sandwich? Prior to the invention of the Sandwich in 1762, there were few convenient snacks that provided the opportunity to 'eat on the go'. Fact 3: Who invented the Sandwich? The inventor of the Sandwich, John Montagu, was born on 13 November 1718 in Chiswick, England died on 30 April 1792. Fact 4: Who invented the Sandwich? John Montagu was a notorious gambler and the invention of the sandwich was created due to his reluctance to leave the gambling table. Fact 6: Who invented the Sandwich? Following his education he embarked on the 'Grand Tour', the traditional trip of Europe and the orient taken by wealthy nobles and members of the Upper classes. Fact 7: Who invented the Sandwich? John Montagu led a privileged lifestyle and obtained prominent positions in the government and in the military. But he was an incompetent man and his life was dogged by scandal and corruption. Fact 8: Who invented the Sandwich? The reputation of John Montagu was not shared by the famous explorer Captain James Cook. When John Montagu, 4th Earl of Sandwich was First Lord of the Admiralty he approved funds for fitting out Cook's ships for his expedition to the Pacific Ocean. To show his deep gratitude to John Montagu, Captain James Cook named the Sandwich Islands (Hawaii) after him. He also named the Montague Islands off the south east coast of Australia after him and the South Sandwich Island in the Atlantic and the Montague Island in the Gulf of Alaska. Fact 9: Who invented the Sandwich? The famous story of invention of the Sandwich was documented in an acerbic, scathing 1765 travel book called 'Tour to London; Or New Observations on England and its Inhabitants', by the French writer Pierre-Jean Grosley (November 18, 1718 - November 4, 1785). Fact 10: Who invented the Sandwich? Pierre-Jean Grosley was an Anglophile (the Seven Years War between Britain and France ended in defeat for the French in 1763) and therefore probably took great delight in smearing of John Montagu. Grosley wrote in his book that Montagu was involved in a marathon poker game and couldn't be bothered to leave the poker table for dinner. He therefore asked a servant to bring him a piece of meat, stuffed between two slices of bread, so he wouldn't smear food on his cards. Fact 11: Who invented the Sandwich? The English variation to the story that in fact John Montagu was working so hard at the Admiralty that he did not have time to leave his office in order to eat. Fact 12: Who invented the Sandwich? In 1772 Edward Gibbons wrote of seeing more than twenty of the "noblest and wealthy" in a fashionable Coffee House "supping on a bit of cold meat or a sandwich". Fact 13: Who invented the Sandwich? Apparently other people, had began to order the convenient snack at the Coffee Houses and not knowing what to call the dish asked the proprietor for "the same as Sandwich! ", and thus the "sandwich" was born. Fact 14: Who invented the Sandwich? John Montagu died on 30 April 1792 but his name will never be forgotten due to his invention of the sandwich. Fact 15: Who invented the Sandwich? Given the history between America and the British, the sandwich (named after a peer of the realm) was not referred to in the United States until some time later. In 1837 Eliza Leslie wrote "Directions for Cookery" and listed ham sandwiches as a supper dish. Fact 16: Who invented the Sandwich? The Sandwich grew in popularity during the 19th and 20th centuries and to this day remains a firm favorite as a modern convenience food. Fact 17: Who invented the Sandwich? Every year July 13 is celebrated in the United States as National Sandwich Day and the sandwich is also celebrated in May during the British Sandwich Week. Fact 18: Who invented the Sandwich? Countless sandwiches are prepared in the home but people are now grabbing a sandwich as the ultimate 'food to go'. In Britain alone sales of over 3.5 billion sandwiches are made every year.